In this book, Pascal Costantini gives a lively and wonderfully readable account of ten years of efforts by a small group of investment analysts to find a reliable, practical and implementable method for valuing and selecting shares. The result of their effort is an original investment methodology called CROCI (Cash Return on Capital Invested), best described as a variation of the economic profit model. For over a decade now, Costantinis group at Deutsche Bank has been using this valuation tool every time it has had to take a view on the pricing of an equity asset, be it a market, a sector or an individual sharein other words, every single working day, since it is this groups job to advise institutional investors on equity valuation. Costantini describes in detail, accompanied by concrete examples in the form of charts and graphs, the precise investment results of the actual implementation of the CROCI approach in the global equity markets since 1996. Readers will enjoy taking this journey with Costantini to see how and why the model was developed, assess the results of ten years of actual implementation and measure the successes of using this model in stock picking and portfolio construction. This book will also make it easy for them to see how the CROCI approach can be used successfully by others now and in the future. The book is divided into four parts. The first part is a review and discussion of the fundamentals of investment analysis. The second part is dedicated to the construction of economic data, with the sole objective of calculating an economically meaningful asset multiple and relative return, the combination of which gives an economic PE ratio, the authors main stock selection tool. While the economic profit model is not exactly new, it is still largely ignored by the investment community. In essence, it does three things: it calculates the real amount of cash, or value created by a business; it compares the market value of an asset to an approximation of its replacement value; and it assumes that the former will converge to the latter through the arbitrage of investors and capital providers. The third part is dedicated to the analysis of economic data, and the last part deals with the actual implementation of the CROCI economic profit model, including real life examples. This final part also discusses how to use the output of the CROCI model with individual stocks, and then with investment portfolios. Primary audience: Investment Professionals, specifically equity analysts, both on the buy side (working in investment management firms) and on the sell side (working in investment banks), and portfolio managers. Pascal Costantini is a Managing Director in Deutsche Bank’s Global Markets Research. He researches and designs systematic equity trading strategies for a multitude of applications, including proprietary trading, structured and derivative products. Mr. Costantini runs Deutsche Bank’s Global Valuation and CROCI Investment Strategy Group. This thirty-member team focuses on the relative value of the top 700 companies in the world, and designs investment strategies for institutional clients as well as for structured products. Prior to this, he was the Bank’s Global Sector Strategist. Mr. Costantini's area of professional interest is equity valuation and sector rotation. 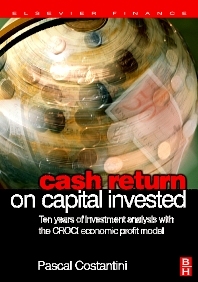 Together with his London-based team, he has developed the proprietary CROCI (Cash Return on Capital Invested) metric, a model that calculates the level of excess return (“Economic Profits”) generated by a company or industry, and extracts from the market valuation the competitive advantage period expected by investors. He gives numerous lectures on valuation and teaches a post graduate Finance course at the University of Paris Dauphine. Pascal joined Deutsche Bank in 1995. Prior to this, he worked for S.G. Warburg as Head of German Research. He has degrees from the Institute of Political Sciences, Lyons and from the Ecole Supérieure des Sciences Economiques et Commerciales (ESSEC), Paris.